Motto: "Rise up and I will kill you! Again and again!" the reason i take mine out of box is because i like to transformerm them and kind of play sometimes. 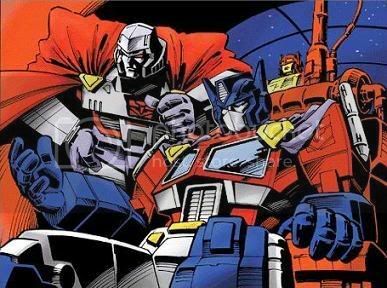 Motto: ""Freedom is the right of all sentient beings""
This may sound mean but its not meant to be. I find it hard to transform my transformers when they're still in the box lol. with the exception of my mp, exclusives, and alternities i open them and display them. dont get me wrong i open almost all of them, but keep the packaging for some as they can be displayed in their boxes. Hi peoples. I realize I'm a little late to this discussion, but I've read most of the posts. Everyone seems to have perfectly good reasons to collect the way they do. I'm sure if all had an unlimited supply of money and space, we would all get at least 2 of each figure, one to open and one to keep MISB. One of my best friends in the world I met at Botcon last year. He collects MISB only, and he got sick and lost sleep the one time he open a figure, which was not rare in the least. He absolutely fears a dinged corner, or a faded cardback, and the poor guy is stressed out! I give him a hard time, but to each his own. Anyways, I think we can all appreciate the hobby, however you do it. Plus, what a bunch of wonderful pieces you all have! Great stuff, in or out of the box! Some collectors only collect Super Rare items. More like antique collecting than toy collecting. If I had prototypes and Lucky Draws and equally hard to get figures, I wouldn't play with them either. For me, a nice middle ground is best. I have some rare stuff that does not get handled, or if it does, only for the occasional dusting. But other than that, I'm with you. Yeah, I'm coming into this late as well. For me, I open almost all of my TF's. But I do have some that are MISB and they are usually the japanese G1 figures/reissues/TFCollection pieces. I like the packaging and how they look. I actually appreciate a good looking package. But for the most part, I open everything else. I totally get why you want to have them in MIB though. I don't collect for value either, I just like how parts of my collection look "mint". I tend to keep most of my japanese toys boxes, and throw away almost all the US boxes. But there are always exceptions to every rule. Prime Evil wrote: Yeah, I'm coming into this late as well. For me, I open almost all of my TF's. 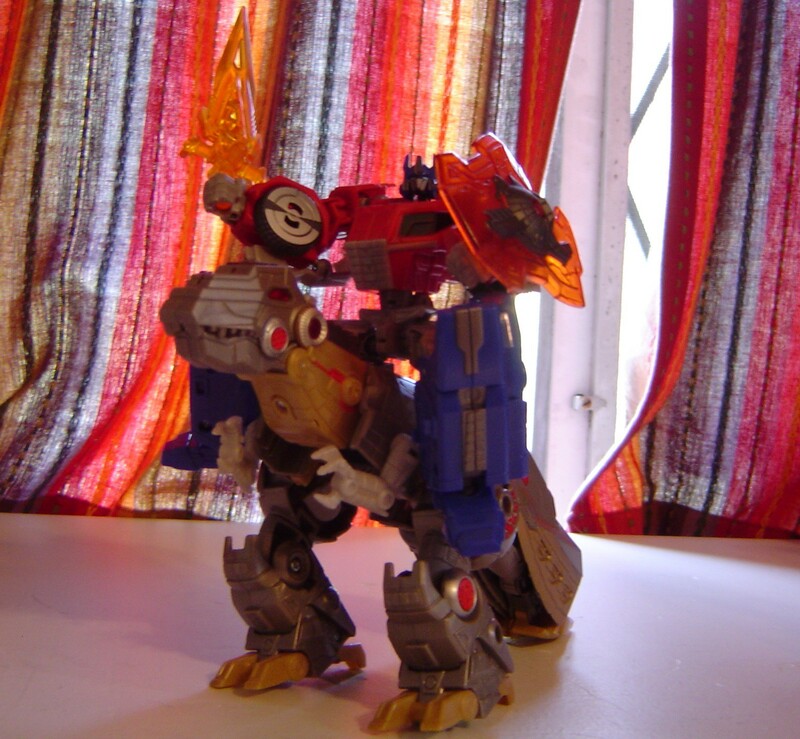 But I do have some that are MISB and they are usually the japanese G1 figures/reissues/TFCollection pieces. I like the packaging and how they look. I actually appreciate a good looking package. But for the most part, I open everything else. I totally get why you want to have them in MIB though. I don't collect for value either, I just like how parts of my collection look "mint". I tend to keep most of my japanese toys boxes, and throw away almost all the US boxes. But there are always exceptions to every rule. Right on. I keep ALL my packages and open them with surgical precision. Not for resale ( I hope that day never comes) but in the hopes that I will one day have the space to display my figures in box. 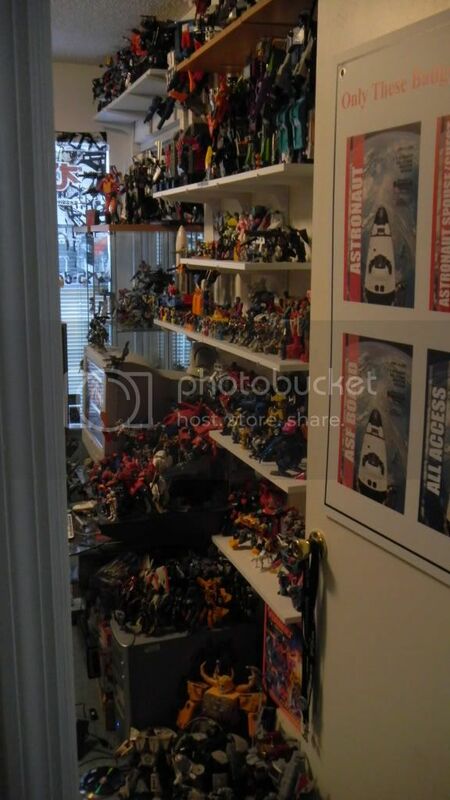 Out of about 1100 Transformers, I have boxes for atleast 700, and they take up nearly every closet in our condo! I open most of mine but save my boxes. the only MISB I have are my united figures. I plan to sell those down the road to buy other stuff for my collection. Motto: "Life is like a triple-X choose your own adventure..."
All my loose figures are displayed on bookshelves, while my MISB figures are stored in bins in the closet. If it's rare enough that I'm afraid to damage the packaging I won't dare put it on my shelves (not until I get some really nice shelves) . I collect both, but if it's an everyday run of the mill figure I got from Walmart, target, or even an MP import (something with a mass run) I open it. If I think It's going to be super rare, I actually buy 2 so I can have one on display and one in the box. Essentially I'm just collecting my childhood favorites and seeking the best possible mold for each one, though. So I'm not really collecting ultra-rare figures here. I just want the ones the I think look really awesome. That being said, I have, when short on cash, sold a few of my rare figures, in box or out of box. Either way it was really hard to let them go, but when bills need paying survival wins over collecting. I prefer out of box, because an army of Sweeps or Seekers just doesn't look as impressive in the box as they do swarming around Unicron and Cybertron. I opened all of mine (reason below) except two. RTS Jazz and Animated Bumblebee and they are all the second figure. For RTS Jazz, since I was repainting my first one, in the fear of screwing up entirely, I need a second one in spare. For Animated Bumblebee, that one is for my son. He already had one but lost a rocket booster. So my wife wanted to get him another one when it was on clearance sale and kept it MISB until he is older. Besides transforming, playing and displaying Transformers, I also have a hobby of photo taking them. Some are scenes from cartoons/movies/comics, some are posing cool, some are jokes, some are showing off after brushing. Since I do this mostly at night, so I call this "picture night" and enjoy it very much. My wife always makes fun of me saying "so, tonight is who's picture night?" or "oh~ somebody will be very happy today because it's his picture night". I don't buy super rare or super exclusive items. Besides I don't want to spend that much money on them, I also know if I have them, I might have the fear of touching them and keep them MISB and that sort of against my hobby. Maybe someday I might, who knows. Can I ask a question about your siggy? Why is there a picture of Dumbledore to accompany a Yoda quote? He's gone one better than that - its Gandalf with a Yoda phrase misquoted as Dumbledore. Play with them, have fun with them, display them proudly. If in the box is your thing, great, but it's not for me. If u want to collect G1 and unless you have a pretty good fortune to burn, it's hard to do in box, since I'm displaying them anyways, loose complete figures are wonderful for me. 100% agree. What he said.